In Argento Silver with Blu Connolly hide. The Ferrari was supplied new to gentleman farmer Mr. John Greenly of Titley Court, Kington, Herefordshire. He ordered it in white with blue Connolly hide, a Blaupunkt radio, a passenger door mirror and the very rare factory option of a luggage platform replacing the rear seats. 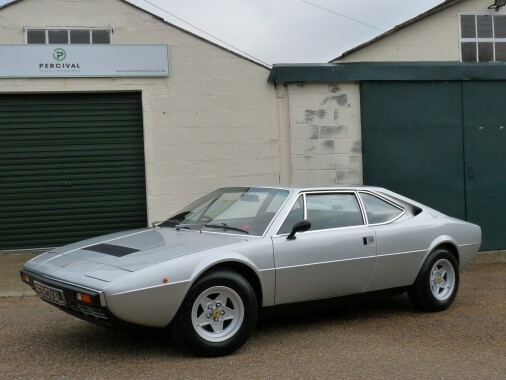 It is believed that there are only three or four right hand drive 308 GT4s with this. My Greenly kept it until his death in the early nineties. In 1995 the car was sold by the family to a neighbour who had known the car since virtually new, with about 30,000 miles on the clock. Talacrest sold the car in October 1998, selling it again in 2000 when the owner transferred to the US. They changed the colour to factory Argento Silver in November 2000 on the request of the next buyer who kept it for a couple of years, eventually changing it for a 550 Maranello. The GT4 was bought by a gentleman in Surrey and it last changed ownership in March 2005 when a long term customer of ours, and Italian car lover, acquired it. The history file includes details of ownership, extensive service history including numerous cam belt changes, and records of the specification and previous sales. Rardley Motors and The Ferrari Centre have maintained the car for the last thirteen years. The Ferrari Centre in Maidstone carried out a full cam belt service in August this year at 52,636 miles. A low mileage, low ownership GT4 with excellent provenance.